As a wedding photographer in Connecticut, I am honored to be part of many weddings all over the state. I feel very privileged that I am chosen to be the photographer to capture the couple's special day. I try to capture that day the best I can but I must admit I love documenting all those details. Many brides have different budgets and some chose to have more simple flower bouquets. This bouquet was just simple beautiful roses. 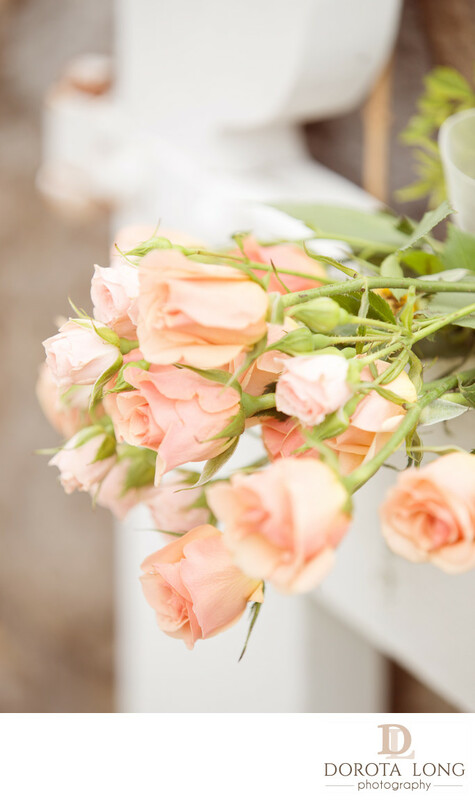 I asked the bride to put the roses on the white fence and I took a photo of them with a very shallow depth of field. I used my 70-200 lens at 200mm because I was looking for a nice background compression. I love how the white fence gave the flowers a beautiful clean background. This is one of my favorite bouquet images even though it is so simple. So simple but so timeless and so beautiful. The day was cloudy and overcast but at least it was not raining. It was not the best light for photography that day but everything turned out so perfect, I could not ask for more. The bride and groom were in love with their images and so was I.